This topic is dedicated to Tox protocol development and beta-testing. 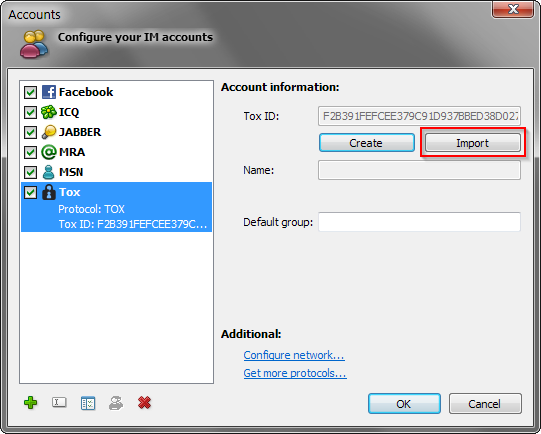 If you choose not to import old Tox profile - press "Create" button to create a new one. Similarly. Please share a file. Or can you say that you need to reinstall? Или может, скажете что нужно переустановить? It's just a debug builds, i will rebuild it as release in a short while. блин, айдишка сменилась а так круто. только ника нету, хоть в настройки и вписал. It works! And sends messages too! I have a question. For users who did not import their profile - where in Miranda can they check their own Tox ID so I can add them? (I got my Tox ID from uTox as I have been using it previously). I think it should be easily visible somewhere, like in my details or on the account page - to make it possible for the user to link it to another user. Otherwise, stellar! Didn't take long to make this! I have a question. For users who did not import their profile - where in Miranda can they check their own Tox ID so I can add them? In search section enter the ID and press "Add to list" without pressing "Search" button. It supposed to work this way, although I'm not sure that it works at all yet. But you can try anyway. After running the dbchecked, it said there were some duplicate items (skipping). After launch, I checked history and found that the check garbled some of the history. I used the "mark events as read" option, because all events were shown every time I opened the chat window (and I know that marking all events as read fixes this). I noticed the same behavior with Steam history so I assume this is some sort of a bug - but I don't know which plugin this relates to. DB checker? History storing itself? I think it's not implemented yet. I hope unsane will answer it tomorrow. Binaries updated to r10234. Please update manually from attachments in the first post. Hello! Great, now I can see my Tox ID in the accounts pane! However, it would be nice if I could somehow copy it (or see it somewhere from where it can be copied) to share with a friend. Added in the latest binary. Another thing is - the issue with the database; is this related to tox/steam protocol or is this something else? Because (as I said a few posts above), these two seem to be showing the same kind of issue. Do you want some more reports about that? Thank you for your continuous effort to improve Tox support in miranda! However, every time I restart miranda, my "nickname" is lost (and I become the "tox ID" instead, so it looks very weird in the chat window). Also, setting nickname only affects my miranda - others don't actually see the change. I "fixed" this by simply loading the tox profile in uTox, changing the necessary things, saving it, quitting tox and then moving the profile back to where miranda expects it. Nickname etc is now stored correctly :3 this should be fixed, hehe. UTF-8 / unicode characters (stuff like: "š ř ž" etc.. ) set as status message in uTox (or other tox clients) are not properly recognized by Miranda - ( uTox is able to display them, however - so the information is properly stored in the stream.). In miranda, they become random garbled characters. Fixed in the latest binary.